Saturday Night: Clouds building. Not as cool with lows into the upper 50s. Sunday: Wettest early with scattered rain, embedded downpours. Thunder cannot be ruled out. Mostly cloudy with highs in the 60s. Labor Day (Monday): Beautiful and sun-filled with highs near 80. Clouds will continue to thicken Saturday night, as the remnants of Harvey creep closer. Rain will spread into New England from south to north, starting just after midnight in Connecticut. The rain will be through much of Massachusetts, Connecticut, and Rhode Island by daybreak. At the same time, some early sun will still be visible in far Northern New England before clouds win out even there and rain arrives later in the morning and afternoon. The rain will continue off and on during the day, ending late in the afternoon in Southern New England. Some late breaks of sun are possible. Overnight Saturday Night: Cloudy. Lows in the 50s. Sunday: Showers, breezy. Highs in the 60s. Monday: Mostly sunny, breezy. Highs around 80. Most places will see 0.25-0.75”, with locally higher amounts where some downpours set up in the higher terrain of Northern New England. This is needed rain, as parts of the South Shore just had the driest August on record. Winds will also be strong from the South Shore, to the Cape and Islands, and then right back along the Connecticut and Rhode Island coasts. Some gusts will approach 40 MPH there. Temperatures will stay in the 60s. 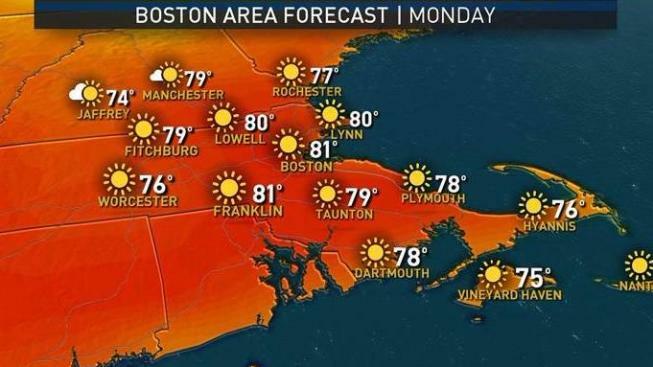 Sun is back on Monday with highs in the 80s. Tuesday will be the warmest of the next several days, with more 80s. It will even be a little humid by then. A cold front drops into Northern New England Tuesday afternoon, triggering a few showers or storms. Those showers then reach Southern New England Wednesday and Thursday, perhaps lingering into parts of Friday depending on how quickly the front departs. Also around that time, we’ll focus on Hurricane Irma which will be approaching the Bahamas. It will likely be a major hurricane at that point. It’s still far too early to know where the storm goes from there, but by next weekend it will likely have impacts to the East Coast.